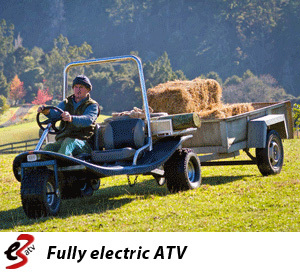 Switch EV Global (SEVG) is a New Zealand registered company specialising in the design and manufacture of fully electric propulsion farm vehicles. It also acts as a marketing agent for other farm vehicles. Based in Warkworth, New Zealand SEVG’s products and services are manufactured to the highest standard and backed by a generous warranty. There is a significant need for safer, more economical and convenient vehicles for the agricultural industry. If you are seeking to solve a unique production or harvesting need, SEVG welcome enquiries for the development of custom type electric farming vehicles and attachments. SEVG’s current flagship vehicle is the e3 ATV. It was introduced at the Agricultural Fielday at Mystery Creek in June 2014. It is electric powered. Your standard 240v power supply will provide a complete charge in under 6 hrs. Fully charged the e3 travels up to 60kms on farm terrain. The e3 is a safe, easy to drive electric vehicle with significant savings in running costs. Go to Contact to arrange a totally obligation free e3 test drive on your orchard or farm. SEVG’s prototype e3 SCV is being developed specifically for the Hotrticulture industry. Fully electric, it can be controlled either on board with a joystick or remotely from a mobile phone. SEVG are the New Zealand agents for the RAT Barrow. 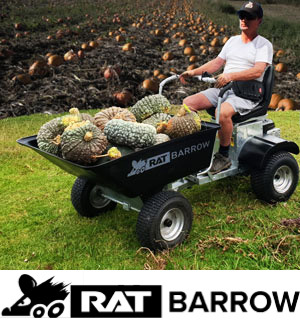 It’s the ideal ride-on barrow for easily moving stuff around your property. Its simple to operate and highly manoeuverable.